Autumn around here isn’t necessarily something that leaf peepers would come flocking to, as they do in my hometown in Indiana, but the season has its own charm. The top photo is in the “high country” around 4,640ft or so just before Devils Punchbowl in the Siskiyou Wilderness. While it’s not the most dramatic hike in regard to fall color, it is amazing for the conifers. It almost looks like a botanical garden set in granite peaks! Somewhere around 15 or 17 species are found up here, some left from the last glaciation period. Speaking of glaciers, the little lakes up there were carved by them. Worth a visit to this sensitive area–just tread lightly! You’d think with all the yellow around, people would get sick of it, but October is odd here. Along with a scattering of blue-sky days, the thickest fog comes around during this month [9 days straight of fog, 3 minutes of sunshine on the 9th day, little over an hour on the 10th day, and about a half an hour this morning, the 11th day]. The golden yellows of autumn serve to remind us that we don’t live in a world of grey tones. 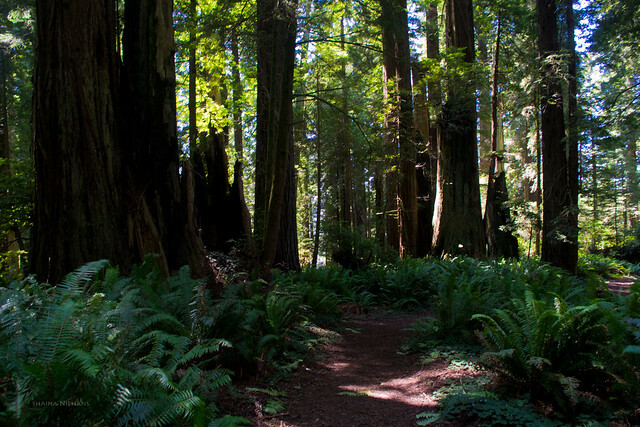 I’m not sure what you think of when you think of a redwood forest, but for me, it’s the lush, Pacific Northwest version where Ewoks could plausibly roam between the six foot tall sword ferns. For a change of hiking scenery, we left the lush Endor redwoods of the north and went down to the alien landscape of the central redwood world. 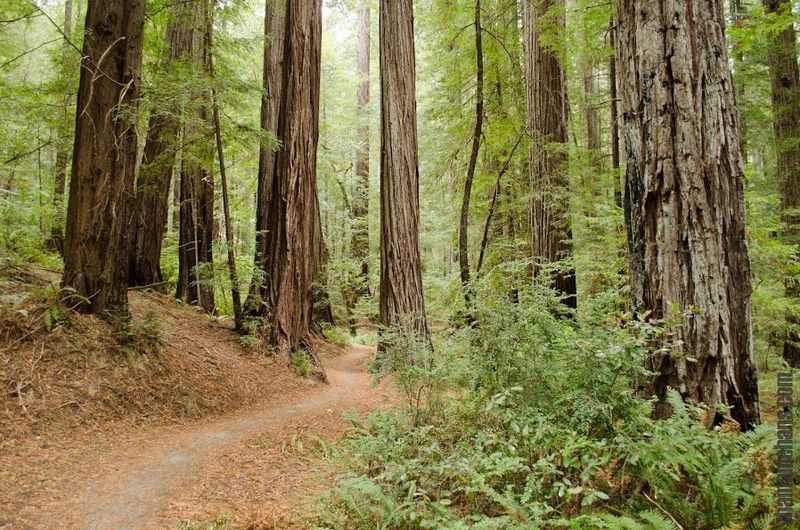 Humboldt Redwoods State Park is redwood forest, but not the redwood forest like the one that lies to the north. For one, it’s warm. 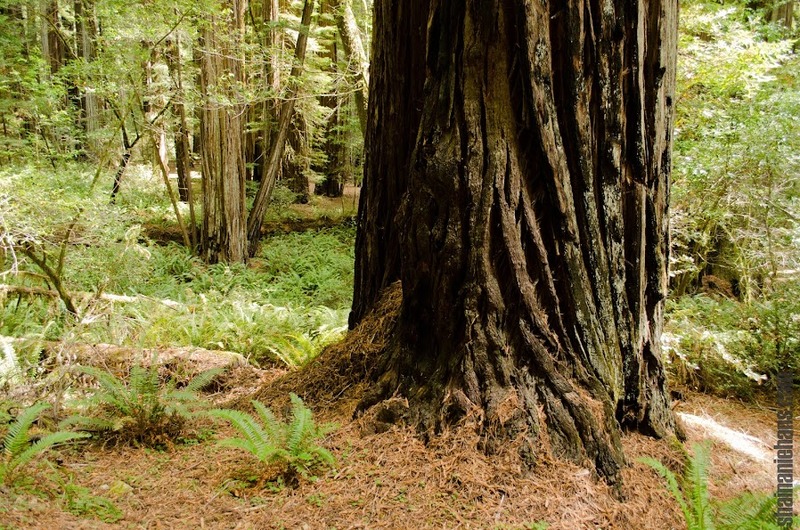 And compared to the hide-and-seek the tree behemoths play in the dense northern forests, these redwoods are in plain sight, no guessing as to what might be hiding 3 feet from you, or up in the canopy. Especially along the Bull Creek terrace, uniformly straight redwoods create a visual wall of wood, sparsely broken by the few understory plants around. 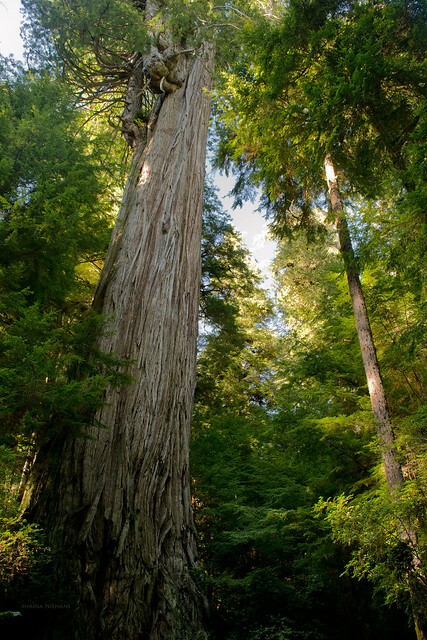 While the majority of tallest redwoods are found here, only two of the 20 biggest by volume call this place home. 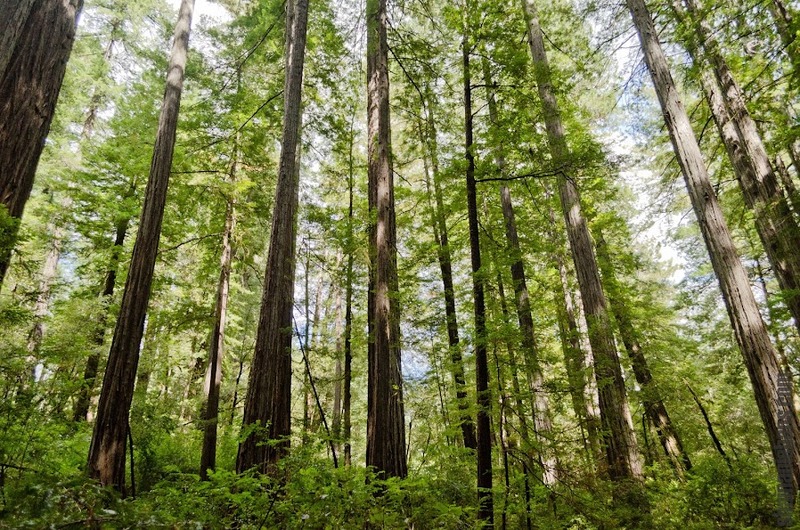 And if you’re keeping track of redwood growth patterns at home, generally speaking, redwoods grow up first, then eventually focus on getting wider both at the base and in the canopy. Walking the trails, we debated why these redwoods, sheltered from the brutal winds of winter storms, couldn’t be as massive and old as the redwoods to the north. Considering the drier environment, they could be decently old, but just not as wide at the base or in the crown due to smaller growth rings that come with less precipitation. But there’s also the fact that so many of them are nearly identical in diameter, likely being close to the same age. I have a theory, but nothing to back it up with besides observations. It seems that something took out all the redwoods along the creek maybe 700 or so years ago. Flood? Fire? Not sure, but the only flood references I could find were from the ’50s and ’60s. On the hillsides, it almost seems as if large fires ate away the larger redwoods, leaving the young burl sprouts that grow after the fire as markers of the massive tree that once stood. Fire and flood perhaps currently keep the largest trees from growing in this area. Considering we didn’t see any Ewoks on our hike, I guess they didn’t like living in this area either. Probably too much fur for how warm it is down there! Maybe a cathedral ring? If so the parent tree, from which the smaller side trees sprouted, might have been nearly the same size as the current largest redwood. Husband used for scale. Recreation of today’s events, but with a coat last year. I forget what summer is like for most people. Hot. Sticky. Blue skies, white clouds. Lightning bugs and cicadas. 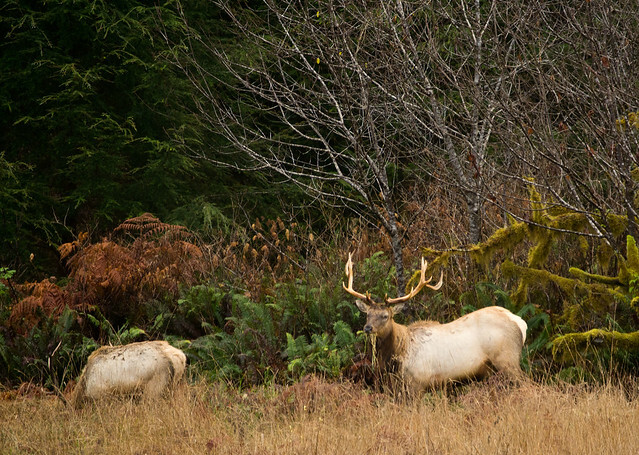 For me, it’s cold fog, yellow-spotted millipedes, and elk calves. At the 4th of July fireworks last year. The fog is our summertime blanket. It insulates us from the dry heat and from normal summers. 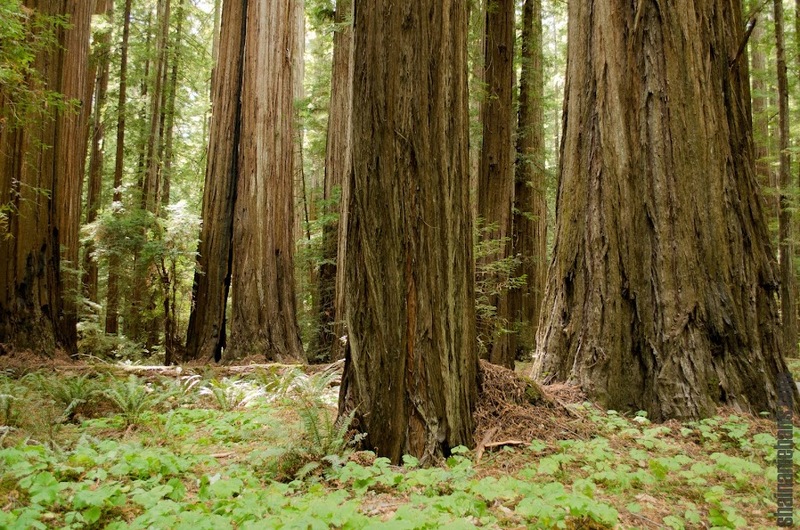 It provides a livable habitat for the Redwoods, who wouldn’t last long in dry air. Our summers are without rain, if you ignore the fog drip. Banana slugs and salamanders abound. Fog and Redwoods, what could be better?! For banana slugs and salamanders, their lives depend on staying moist. They can either seek shelter during the dry spells, or if they are lucky, thrive under the foggy gray blanket of summer. 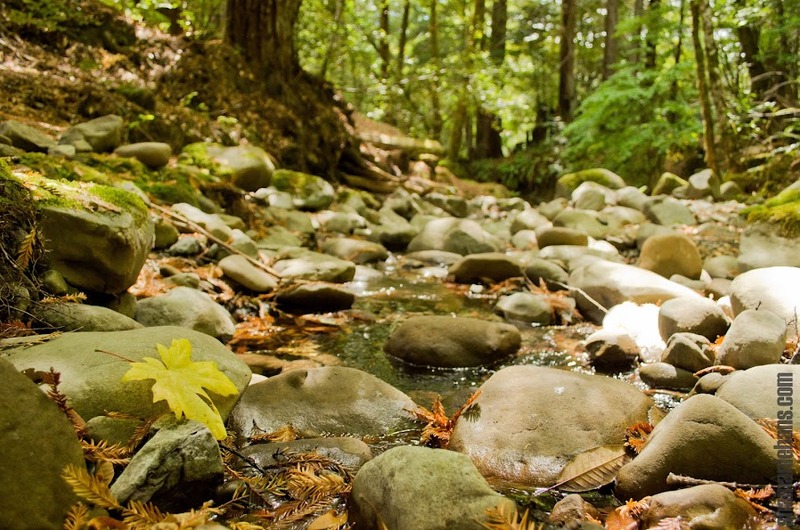 For Redwoods, estimates of up to 40% of their water intake over the summer can be attributed to the fog. So, my memories of hot summers are drying up while the Redwoods are soaking up the fog drip. You can also hear them sigh in relief as fog rolls through the quiet forests. I preface this list with the disclaimer that this is, of course, not official. For that, please see www.nps.gov/redw. 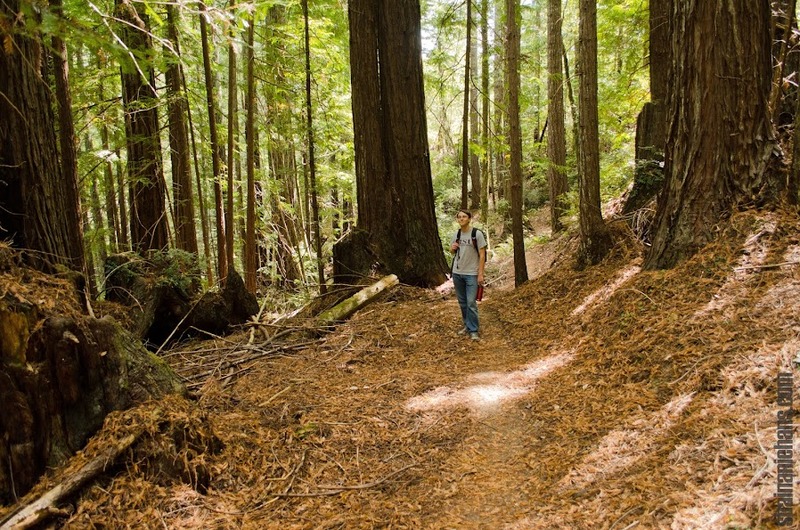 There is also a nice site, http://redwoodhikes.com/ that has information on the many redwood parks and their miles and miles of hiking trails. 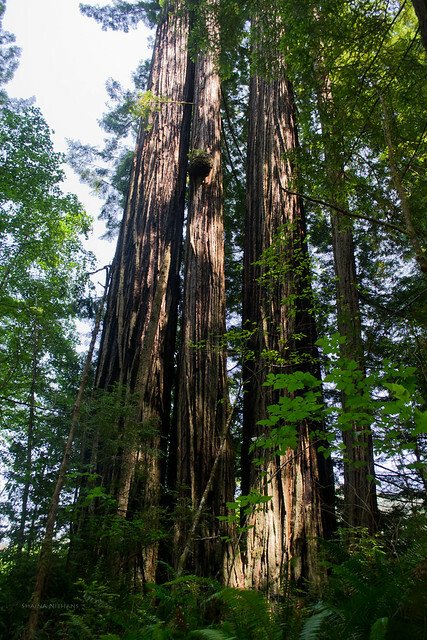 The tallest tree in the world is indeed a coast redwood [Sequoia sempervirens] and it just so happens to be in Redwood National Park, but don’t be fooled, it is not in the Tall Trees area. There is no trail out to Hyperion, the tallest tree on the planet at 379 feet and some inches. But, please, don’t be too disappointed. This tree likely won’t hold the record forever. Not to mention, standing at the base of it, it would be impossible to see the top; its base isn’t the widest of the trees either and one could likely walk past it never knowing which tree it was. So why hide the tallest tree? Aside from the facts stated above, it is likely that increased foot traffic around the base of these tall trees does significant damage to their shallow root systems. When the roots are damaged, the tree starts to die. The top that fell off the top of the world’s former record holder could likely be attributed to adoring fans walking on the roots. One other note: I mentioned the Tall Trees Trail above. If you are in a hurry, or don’t feel like walking a 4 mile round trip trail that goes down an 800 foot hill and back up, there are *plenty* of other options to see tall trees, ancient trees, you name it. 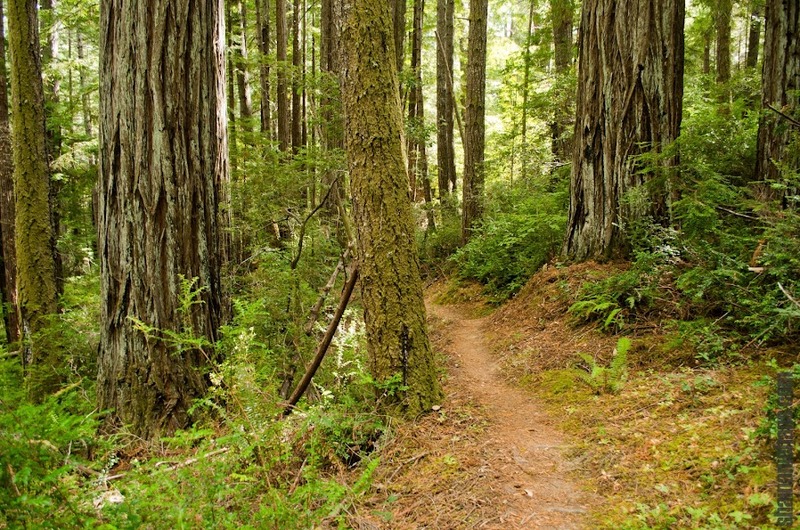 In fact, there are only a dozen or so redwoods on that trail, so if you want to see many, many redwoods, check at the visitor centers for other options that are shorter, or even longer, whatever you prefer. Often, I meet people travelling South that drove the 40 some miles from Crescent City and didn’t know to take the Newton B. Drury Scenic Parkway. This parkway cuts through Prairie Creek Redwoods State Park, and if you came to see the redwoods when you were a child, you most likely drove this road since it is old Highway 101. While the speed limit is slower, continuing on Highway 101 will take you up a large hill [requiring more gas] and add a few more miles, plus you’ll miss out on all the redwoods! Along the Scenic Parkway, there are many places to pull over, even hike a trail, and a very nice CCC-era visitor center tucked in Elk Prairie awaits you at the southern end of the parkway. If you are visiting during the peak season [summer], expect fog [technically, it’s stratus], but don’t let that ruin your trip! Some of the best redwood photographs are taken on foggy days when the sun breaks through and sends shafts of light into the canopy [I haven’t been that lucky yet!]. It is an extremely beautiful scene. When there are no clouds, the sun makes it very difficult for even the best cameras out there to deal with the dark shade of the redwoods and the brightness of the sky. The photos will likely end up very dark. Either flash or a tripod are the best ways to cope with the darkness of the redwoods. ”] Related to the fog, the climate here is very cool. Sweatshirts or even coats are a must for most visitors, some of which opt to buy a sweatshirt just for their visit! Of course no one wants their vacation to become a medical emergency, but there are a fair number of things to watch out for in the redwoods [no, not Sasquatch!]. Windy days can send branches from the canopy to the ground with amazing force–enough to send the branch 5 feet into the ground. Best to find some other activity on extremely windy days. Luckily, they don’t happen too often in the summer! And finally, although it does not occur too often in the summer, sneaker waves are always a concern. The Pacific Ocean here is cold, around 40 to 50 degrees, and the waves are often large. Every now and then, one larger wave will run up the beach higher than any of the other waves, sometimes surpassing the rest by dozens of feet. It creates a dangerous, and at the very least, unpleasant, situation for anyone too close to the surf. The force of the waves is hard to escape, and if pulled out to sea, heaven forbid, belly crawling while catching breaths after a wave passes is the best way to survive. On a lighter note, if you do happen to see Sasquatch, some cryptobiologists are looking for him. Someone needs to give him the message!